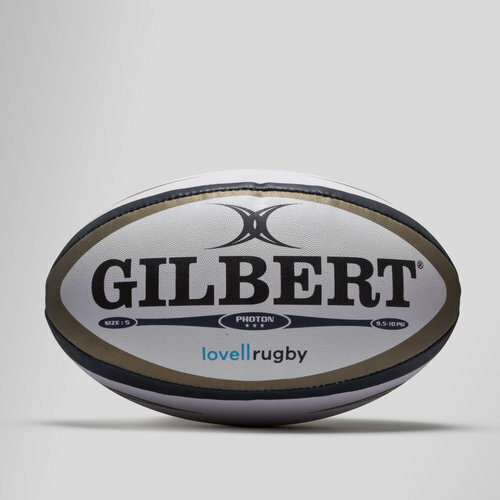 If you need the perfect ball for your team to compete against the local schools with then this Gilbert Photon Ltd Edition Rugby Match Ball in Gold and Navy is the one for you. This limited edition match rugby ball from World Rugby specialists Gilbert is match ready as soon as it leaves its box. Featuring our seal of approval with the Lovell Rugby logo printed on it, this ball is perfect for club and school level rugby. This high-quality ball features a standard grip and has been crafted in 3 ply poly-cotton with a cotton laminate. The Photon has been hand-stitched and is an official size 5 rugby ball that conforms to World Rugby specifications.